Thank you for enlightening me on this topic. I visited the palace museum in Taipei this summer and in a catalogue, I found a photo of a Qianlong lady on this subject. The painting style looks very much like the people on my vase sent earlier. What do you think? After reading what you have written, can I draw the conclusion that one of my Chinese vases and the censer sent to this forum earlier could be late Qiang, around 1900? My answer to your previous post did not get posted before you wrote this. I think you find the answer in the last one. I'm afraid you aren't there yet. :-) You look at the overall impression of the faces, but you omit to look at the style of the strokes, outlines, etc. ...right, just did an image search using 琺瑯彩 after writing the above, and I found its companion. Shelley, we need a lot to learn to understand the whys and hows. 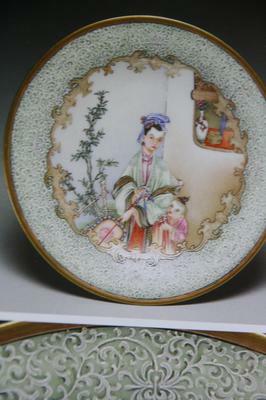 The Falangcai porcelain made in the palace shows western influences, but other porcelain made in private kilns (民窰) does not. There are precedents for such behaviour in the Song dynasty, etc. So, you may find some imperial wares of the 18th centuryhave a slightly western aspect. Only in the late Qing dynasty or early republic, after the Qing dynasty ended, did such items appear outside the palace. So, normally, Falangcai items would be either imperial or 20th century. But, imitating the Falangcai style itself does not necessarily make them Falangcai.